With spring cleaning on shoppers’ minds, a fresh wave of potential customers will be coming into store hunting for the best appliances to spruce up their homes and meet their IoT [Internet of Things] needs. This poses an opportunity for increased sales, so it’s time for retailers to match consumer enthusiasm by entering new categories and stocking this wave of innovative products. Floorcare and handheld cleaning appliance brands, such as Kärcher and Electrolux, will be taking advantage of this increased consumer demand by releasing above-the-line campaigns and promotions for the spring. Retailers should take advantage of these campaigns as they can drive footfall into store. Retailers need to complete the customer experience. Make sure your store is properly merchandised to draw attention to these hero products. Guide consumers on a shopper journey and convert them into shoppers. With the economy picking up, consumers are willing to spend that little bit extra to get the best products that will improve their lifestyles, with reduced power consumption and ease of use. Recent research by Gekko shows that there has been a seven per cent drop in consumer cost-consciousness over the past year. With this in mind, retailers should look to enter new categories and begin stocking innovative products. We can see from the rise in popularity of such products that consumers are willing to pay for the added benefits brought by innovation. Cordless ‘handstick’ vacuums are an excellent example. With space at a premium, handsticks have rocketed in popularity since entering the market in 2013, as people are doing away with conventional vacuum cleaners. The sector is now worth £64 million. With the average handstick costing around £200, consumers are clearly interested in purchasing premium, innovative products, as long as the lifestyle benefits are clear. The rise of smart appliances will also make a big impact this year, as more consumers become aware and understand that the IoT is no longer a concept, it’s real. With many shoppers looking to replace their outdated appliances as part of the spring spruce-up, electrical retailers should capitalise on the current smart-home trend to increase sales of premium appliances. Smart appliances, such as the Samsung WaterWall range of dishwashers and Grundig’s MultiSense washing machine, are good examples, incorporating smart technology into everyday appliances. Why not try a new category like the smart home, with products such as the Hive smart thermostat? What’s important for retailers is to have trained staff that can properly explain these benefits. Despite the hype around new tech concepts such as the ‘connected home’ and the ‘internet of things’, consumers are sceptical about the cost of the technology and the role it will play in their lives, new research suggests. 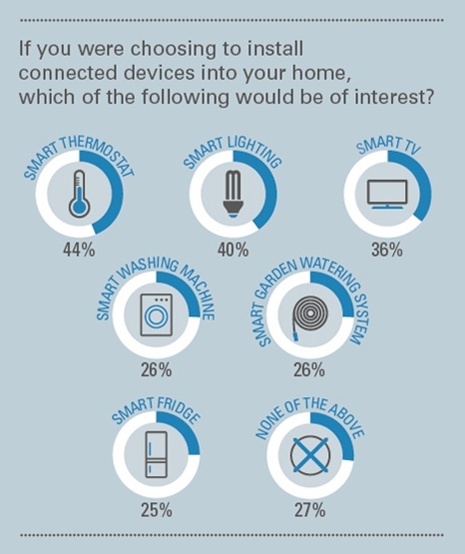 The study, seen exclusively by Marketing Week , reveals that over a quarter of respondents are not interested in having digitally connected smart appliances in their home. The survey of 2,000 UK-based adults, conducted by field marketing agency Gekko, also shows that most people are unwilling to pay more for connected devices. Among the appliances available, the smart thermostat is the most popular with 44 per cent of people saying they would consider installing one in their home. Smart lighting comes second (40 per cent) followed by smart TV (36 per cent). But 27 per cent would not consider installing a connected appliance, with 45 per cent citing cost as their top concern. When asked to specify an additional amount they would be willing to spend on such an appliance, the majority select zero. Thirty per cent of people are willing to spend an extra £100 on a smart fridge that enables users to keep track of their food stocks via a mobile device. The majority (55 per cent), however, are unwilling to pay a premium for such an appliance. Todaro suggests that as the weather turns colder in the coming months and energy bills rise again, utility brands will devote more resources to marketing smart meters that enable people to control their heating remotely. In January, for example, British Gas ran a nationwide advertising campaign to promote its smartphone-controlled central heating system Hive . 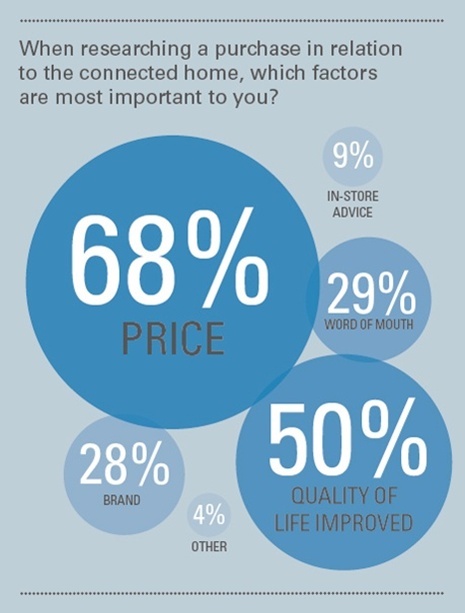 According to the research, 50 per cent of people regard the impact on their quality of life as a key reason for buying a connected appliance, compared with just 28 per cent who care about the brand behind the product. Word of mouth matters to 30 per cent of respondents while 9 per cent regard in-store advice as an important factor. Electronics retailers Currys and PC World are rolling out ‘smart technology areas’ across their stores to help educate consumers and enable them to interact with connected appliances. The companies are owned by parent group Dixons Carphone, which this month completed a £3.8bn merger that aims to put it at the forefront of the internet of things . “We’re also investing in training our store colleagues on smart technology and launching online microsites for customers, which are dedicated to smart technologies such as connected home devices to help educate and inspire,” says Dave Ward, head of new technology and innovation at Currys and PC World. While the cost of installing smart appliances is relatively high, Ward claims prices are beginning to come down as the technology matures. 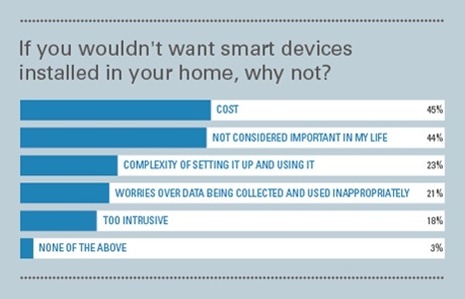 In addition to the cost issue, 21 per cent of survey respondents express concern about how brands use personal data gathered from smart appliances. Eighteen per cent say the technology is ‘too intrusive’ while 23 per cent are concerned about the complexity of setting up the appliances. Technology companies such as US firm Revolv have sought to simplify the connected home by creating a single hub through which all smart appliances are controlled. Revolv provides a router that receives signals from other companies’ appliances and a single app that allows users to co-ordinate all their home technology from their smartphone or tablet. Last month the company launched an Android app to sit alongside its existing iOS offer and announced its integration with Google’s Nest thermostat. “Our brand promise is to unify off-the-shelf devices made by many manufacturers regardless of the protocol within those devices,” says Suttida Yang, director of marketing at Revolv. The entrance of the world’s biggest tech companies into the smart home market is likely to reassure consumers and accelerate adoption. In June, for example, Apple unveiled HomeKit , a suite of tools for controlling home appliances. Apple is working with brands such as Honeywell, Philips and Broadcom to develop the platform. The $3.2bn (£1.9bn) acquisition of Nest in January demonstrates Google’s determination to be a dominant presence in the connected home too. Nest intuitively adjusts its settings according to people’s usage patterns, such as reducing the thermostat temperature setting when it senses nobody is home. But despite excitement around these products, the role of connected devices depends also on government policy towards super-fast broadband. Last week, the UK Government said its plan to provide super-fast broadband to 95 per cent of homes and businesses by 2017 was “firmly on track” after announcing that one million homes and businesses have access already. However, business lobbyists and commentators have criticised the Government for a lack of ambition, claiming that its definition of ‘super-fast’ lags behind many other nations. Gekko’s Todaro agrees with this assessment and believes stronger Government action is needed to support the growth of the internet of things across the UK. “The Government is woefully behind on super-fast broadband,” he says. “Most homes in the UK don’t yet have the necessary speed of broadband to have a connected home.